There are many different styling products to choose from when contemplating how to style your hair and how to hold that style once you are done. The key to getting and keeping the perfect look is choosing the products that are best for your style and hair type. If your are looking for a styling product that will leave your hair soft and offer just the right amount of minimal hold- including such styles as all over soft waves or curls, or added volume and bounce without a stiff look- then a gel product, mousse, or foam is right for you. Hair gels are great for holding the shape of curls or keeping styles that go against the natural pattern of the hair in place. They also work great for eliminating fly-aways and frizz in sleek styles such as buns, ponytails, and up dos. This product also has a light texture that offers versatility. Use the gel sparingly for light hold and a more natural look. Or, use more gel to really hold the style in place. You can also use the product on wet hair and allow the style to air dry. This process will result in a "wet" look that looks sleek and sophisticated. Mousses and hair foams are great for adding volume and body to all hair types and styles. These fluffy products offer a light texture that looks nature when applied to the hair and a soft hold. Mousses and foams can be used to lock in waves or curls, to reduce frizz or fly-aways, and to hold straight hairstyles smoothly. For harder to hold styles, such as short spikes, more defined curls, or slick straight looks, styling creams and pomades are a great choice. These styling products offer greater staying power to more difficult styles without looking to stiff or artificial. Plus, the products are pliable and take a little longer to set so you have plenty of time to work your style and get it exactly into place before these products really hold. Styling creams, also called grooming creams, are available in either balm or liquid form. The balm is more solid in texture and the liquid is more like a very thick gel. These products are used to work hair into more complex styles. For short styles these products can be applied to hair roots and used to add volume or height. For medium length hair the products can be used all over to hold curl or keep strands in place in an up do style. For longer hair, the products can eliminate frizz and keep hair looking smooth and sleek. hair pomades are extremely thick gels, almost solid in appearance, that are great for achieving a super sleek smooth look. This product can be used to smooth out hair strands for buns, French braids, complex up do's, and straight bobs or blunt cuts. Pomades are also great for keeping straight, curly, or side swept bangs in place. If you have chosen a hairstyle that requires some major holding power, such as an all over spiky look, a Mohawk, or a gravity defying up do, you are going to need a product that can lock in your look for hours. Good choices for these styles include hair waxes, putties, and pastes. hair pastes and putties resemble pomades in their solid gel like textures. However, these products are even thicker and have a very sticky feel. To use these products you must first warm the paste or putty in your hands. Once the product has slightly liquefied you can distribute it through your hair and work your style into place. Once the product cools and thickens the style will be held stiffly in place until you wash or comb it out. Waxes work to add shine and hold to short to medium length styles, especially ones that require a piecey look or very specific definition. Wax also adds texture to thin or fine hair. The wax is easy to spread evenly through all of your hair, or to spot apply to certain areas. Once the hair strands are coated and the wax hardens the style will be held firmly in place. No matter which style you choose, or how long, short, thin, or thick your hair is there are two products that everyone needs to get the most beauty and longevity out of their look. These two products are hairspray and a thermal protectant. 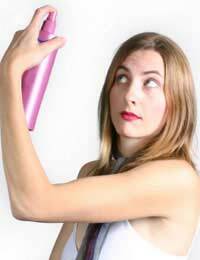 A shot of hairspray is necessary to set any style and give extra hold to even the softest styles. Depending on your look you can choose a light, medium, or high hold spray and use just enough to lightly coat the style and hold your hair in place. A thermal protectant, on the other hand, needs to be used if you use heat in any way to style your look. Curling irons, blow dryers, straighteners, hot rollers, and other heat producing devices can damage hair strands after repeated use. To keep your hair healthy looking and damage free use products such as heat activated shampoos, conditioners, gels, mousse, and hairsprays regularly. By choosing the right products for your style you can keep your hair healthy while maintaining the look you want hour after hour.